Robots, some of them eerily human-looking, are moving into the travel industry. Australian travellers are divided on how much a robot could add to their holiday experience, with almost half of Aussies finding robots “quite frightening”, according to a new global study. The study, commissioned by travel deals company Travelzoo, reveals that two thirds of Australians are open to the idea of a robot working in roles such as a receptionist in a hotel – even though the fear factor affected almost half of the sample. 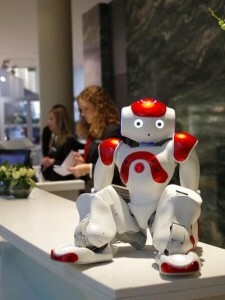 MARIO – a humanoid robot in the Marriott Ghent Hotel, Belgium, is 60cm in height. The hotel uses Mario to welcome guests, provide information about hotel services and local tourist attractions and call taxis, if required. Australians prefer their robots to look like machines rather than humans, but say the robots should still have human-sounding voices. In marked contrast, Chinese respondents prefer their robots to look like people – with 76% favouring the android variety of robot. The Travelzoo Future of Travel project included a poll of over 6000 people in Asia, Europe, North America, South America and Australia. It aimed to determine whether consumers are ready for robots and artificial intelligence to play a major role in travel and hospitality. Robots are already being used in many international hotel chains such as Marriot International, Holiday Inn and Hilton and some cruise lines have put robot bartenders and guides into their ships. Industry reports cite the total spend on robots will exceed USD 40 billion by 2020, with Asian countries Japan, South Korea and China leading the market in both spend and development. As a global average, the Travelzoo research revealed nearly 80% of consumers expect robots to play a big part in their lives before 2020, with three quarters believing they will make their lives significantly better. Almost two thirds are comfortable with robots being used in the travel industry. In Australia, opinions are mixed. An overwhelming majority (93%) of respondents are concerned that robots could be weak in softer skills such as showing emotions. The same proportion worry about robots taking jobs away from humans. Australians doubt that robots will be able to understand informal language such as slang, irony and the Australian sense of humour. Those in the Australian pro-robot camp highlight the unlimited energy levels of robots and eight in 10 respondents believe robots can handle data faster than their human counterparts. The majority of perceived benefits are around data handling, memory and skills like communicating multiple languages. Commenting on the survey findings, Travelzoo Australia general manager Cemlyn Jones said: “Right now is a very exciting moment in the history of the travel industry – ground breaking technology is revolutionizing what is possible from the perspective of customer service, entertainment and personalization. 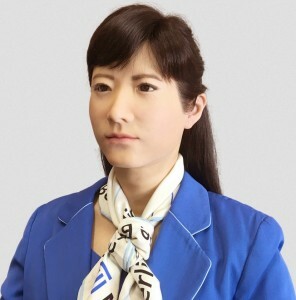 CHIHIRA KANAE – Toshiba’s Chihira Aico robot, a communication android, has been made to look like a 32-year-old Japanese hostess. “Robots and artificial intelligence are making their debut on the tourism stage, and our research into global acceptance of robots working in the travel industry is largely positive. The survey for Travelzoo’s Future of Travel project was conducted in December 2015 via an online questionnaire by third-party research agency Norstat. The questionnaire was completed by 6211 travellers in Brazil, Canada, China, France, Germany, Japan, Spain, the United Kingdom and the United States. A separate study of 788 Travelzoo members in Australia was conducted online using QuestionPro software in February 2016.